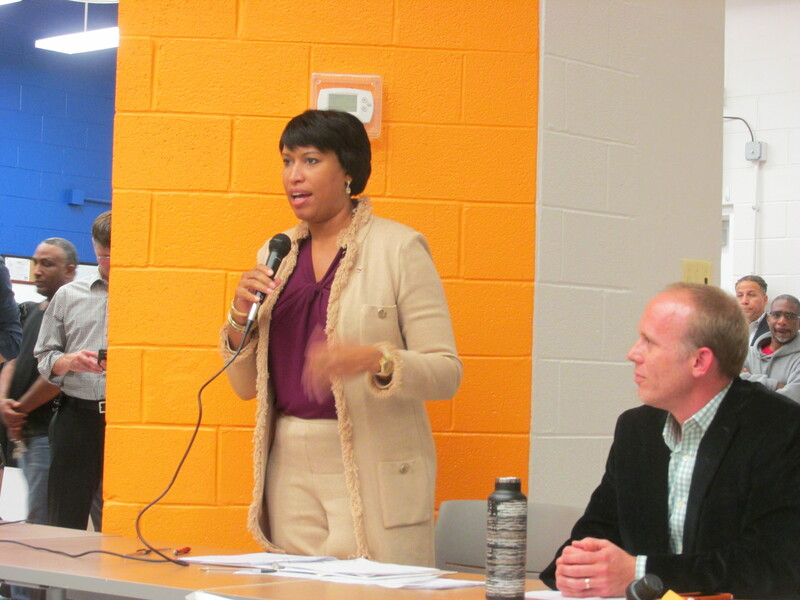 Mayor Bowser Visits Park View — Topics Include the Bruce Monroe Site | Park View, D.C. This entry was posted on November 5, 2015 at 7:01 am and is filed under Community Meetings. You can subscribe via RSS 2.0 feed to this post's comments. I thought the mayor did an excellent job defending the path forward, and seems flexible to changes within set parameters. My only disappointment was in the answer on what is specifically being done to address crime on GEORGIA Avenue, which MPD really failed to provide. I agree. And this is my main complaint with Bowser. I don’t think she does enough about crime. I almost feel like she doesn’t even care — especially in comparison to homelessness. I support that as well, but crime needs to be more of a priority. There is a disconnect between what is actually happening in our neighborhoods and what she is being told by MPD. I mean, MPD’s answers were laughable at the meeting yet she did nothing. Shame they voted against the parking variance, but the condition is somewhat reasonable I guess. I have a more basic question about Park Morton. How long do the residents maintain their benefit of free/reduced rent housing? It seems like it must be for many years or for life based on the discussions of moving people into a new building that won’t even be built for many years from now. Is it actually totally free rent or do they pay some form of discounted rent? Yay concentrated poverty! Did Bowser address how she will assure that the guns, drugs and gangs don’t follow Park Morton to their new location? Or what she will do when a turf war erupts between Hobart Stars and the 640 crew? A little girl was shot in the playground by Park Morton. What will Bowser do to make sure that their new park is safe and not a war zone for the kids who play there, both old and new? Nadeau, Brown, Bowser all refuse to answer these questions. the only answer she gave to that was that it would be mixed income (1/3, 1/3, 1/3) and that all of the residents for PM are not criminals. Of course not all of the residents are criminals but a lot of the crime comes from their buddies and relatives who are. What will the mayor do to make sure that these people don’t set up camp or settle their scores at Bruce Monroe like they have at Park Morton? And New Communities has proven that the 1/3, 1/3 1/3 model is IMPOSSIBLE. I work in devleopment and the general rule of thumb is that you need at least 3 market rate units to subsidize one low income unit. Market rate, not workforce, for that subsidy to work. The precise mix of subsidized versus market-rate units is not necessarily a good indicator of whether a project will be successful. In our area, 3 Tree Flats on Georgia Ave (alongside 4100 Georgia Avenue, where Yes! Market is located) is a good example of a mixed-income, mixed-use development that has been quite successful with more than 1/3 affordable units. At this property, 119 of the 130 units are income-restricted to households earning no more than 60% AMI. The mix of incomes at the property and the mix of financing sources both assure that the property generates enough income to maintain a high level of upkeep. There are likely quite a few households with much lower incomes (30% or less) living at the property, likely because they have vouchers. It is important for neighbors to engage with this process, but let’s try our best not to make bigoted assumptions about crime and poverty before we’ve taken the time to educate ourselves about the public policy we are criticizing. How are you determining the “success” of 3 Tree Flats? Only a few units are occupied and its only be open for a little over a month. High density of subsidized housing had generally been very unsuccessful over time. HUD reports don’t address any of that. I think we need to get past the obsession about what it means to “keep people in the communtiy”–is spring road or Park MOrton park that far removed from the current location. we need to be decontrated low income housing when possible. If Hebrew home is slated to be 30% low income, why not set aside maybe 10-15 units of that for Park MOrton, Then move another 30-5- to a new site at Bruce Monroe )but not to exceed more than 30% of the total new housing there. That would free up at least four buildings currently at Park Morton to be torn down and then build a new building and move the other residents there. I find it stunning that people think moving someone four blocks away is “displacement”– that is the number one reason New COmmunities has been a failure. Housing Authority has said that publicly, in general a build first requirement adds at least 10 years to any project. Is that really what we want. Its time to disperse the concentration. The Bruce Monroe site was just rezoned for a new school zone and feeder pattern (Tubman/CHEC/Cardozo). Residents in this area are no longer funneled to Bruce Monroe@Parkview so PM residents who move here would definitely part of a different school community. Sure but how many would that really affect? Lots of families in the BM/Park View school just got zoned into the school this year when they had the expectation they would go to Powell. They were not able to successfully argue that its a whole different neighborhood. The most important thing is moving this forward. Families will have to adjust or get grandfathered into Bruce Monroe if its that important to them. Some of them may actually prefer to attend Tubman. Where’s the representation for affected community members on the PM steering committee? I’m a homeowner, live on the same block as the Bruce Monroe Park, and will pay for whatever ends up becoming of the site–in dollars and otherwise. The current residents of PM who are getting new facilities make up 1/3 of the committee. Doesn’t seem right that PM should be able to dictate to the community like this. Also, how long do the current residents get to stay there? Is this a life-long free housing benefit or what? It is a good point that Bruce Monroe site is not technically in the neighborhood either. I agree that some of these units need to be transferred, at least somewhere in the surrounding areas and spring road or Bruce monroe seem very reasonable. The question is whether the mayor intends to manage this situation for results or if she prioritizes other items on her agenda. I want the park Morton residents to have new, good quality housing in the area. I also want this project to be well on its way by the next mayoral election. Without this, will be voting for someone else for sure. Shawn, residents do not get “free” housing. It is publicly owned housing at reduced rents that are in line with their income range. Thanks. Does anyone have a link for the exact details? I’m really curious about what rents people pay at different income levels and how long people/families are eligible for this benefit. My understanding is that its never more than 30% of the residents monthly income. Some residents may pay less than $50, some may pay several hundred. what is the resident has no income? do they get evicted? From what I understand, the current residents pay discounted rent or occasionally free depending on the circumstance (number of children in the household, disability, elderly or veterans status, etc.). Its starts to get complicated. The mayor wants to put some workforce housing… Basically, the average household in DC makes $100,000 a year so workforce is considered the bottom 30-50% so… households that make less than $40,000/year. This scale changes based on kids and household size. When they build workforce apartments in Montgomery county, they make them smaller and with less amenities. For example, I went to one where they put apartment units with formica countertops and normal refrigerators next to units with granite countertops. The person who lived in it paid $950/month for a studio as an affordable unit because other studies in the building where closer to $1300. The $950 was determined because it was about 30-40% of her current income. The tenant still paid utilities and that price was subject for change if her income changed or she moved out. The building itself was relatively nice and near to the Bethesda metro. This is basically what the mayor is saying with the goal of 1/3 market, 1/3 workforce, and a 1/3 subsidized. The final subsidized 1/3 would use vouchers or other programs to make their rent even lower (usually more like $300-$500/month). Sometimes it is free when family sizes are large or it is combined with other federal programs like veterans benefits, disabilitiy income, social security, voucher programs etc. Fantastic blog post – I was fascinated by the specifics – Does someone know where my assistant could possibly locate a fillable DHCD Tenant Petition/Complaint example to fill in ?